Turning customer and employee insights into better results. We help customer and service based organisations to gain insight by cleverly linking relevant data. We help customer and service-oriented organizations gain insight by cleverly linking relevant data. We work daily at the cutting edge of data science, customer experience and employee experience. We provide insight and solutions for improvement by using informed models and combining different data sources. 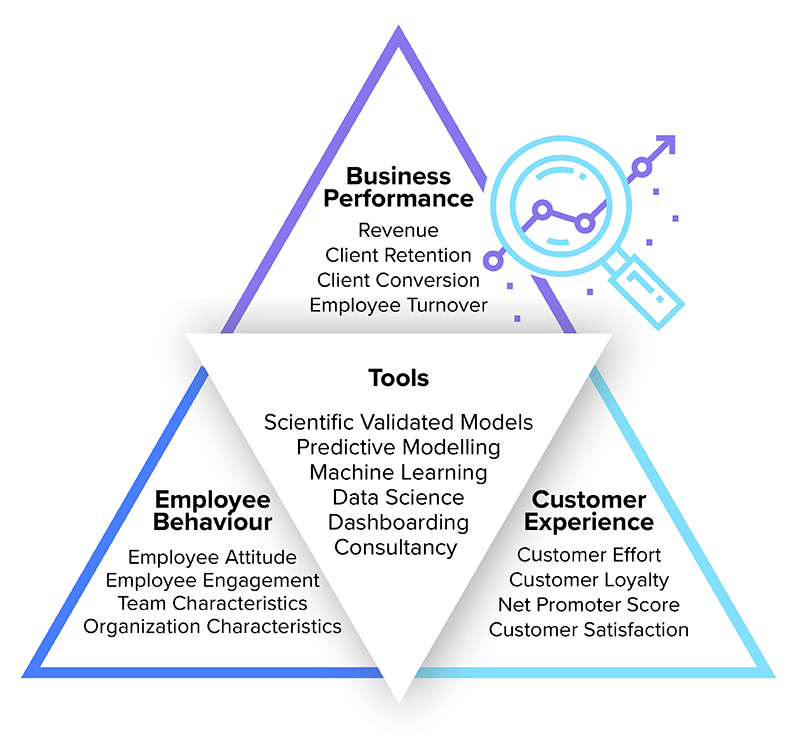 By linking (big) data analysis on the behaviour of employees, customer experience and results, we provide insight into practical possibilities to improve customer satisfaction and operating profit. Employee behavior, customer satisfaction and business results cannot be seen as independent. They are interdependent, influencing each other and amplifying each other. In our vision, the employees involved, a better customer experience and better business results, form one integrated whole. Transavia is an airline founded in 1965 and transports both business and holiday passengers throughout Europe. Since 2003, Transavia has been part of KLM – which is part of the Air France KLM group. They are among the largest aviation group in Europe. Transavia had nearly 7 million customers in 2015 and employs more than 1500 employees. Everyone realizes that when your employees are happier this will always benefit your company. In order to act Customer Experience Manager Evidence Based, it is important to recognize (own) qualities, and pitfalls.